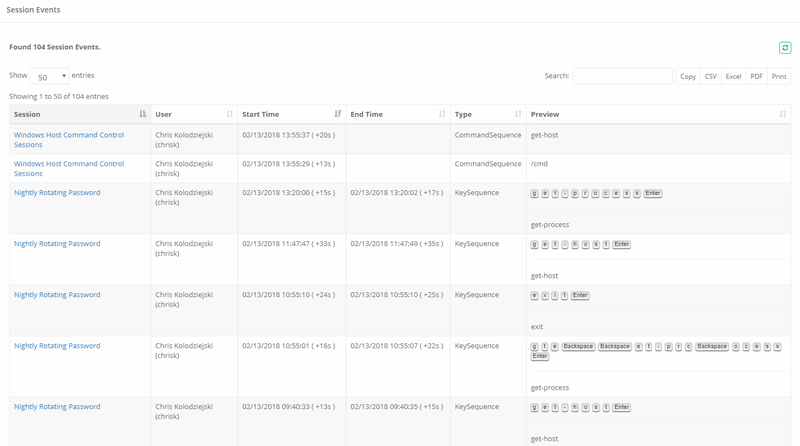 The Session Events report provides a list of all keystrokes, clipboard text and command sequences users entered during any remote session. Use this report to investigate session activity and search for keystroke or command entries throughout all sessions. Session: Displays the name of the record that was used to connect to this session. User: Displays the user that entered these session events during the remote session. Start Time: Displays the timestamp (MM/DD/YYYY HH:MM:SS) of when the session event started. The value in the parenthesis displays the time from the beginning of the session that this event was captured. Use this value to quickly locate the event if viewing the session recording. End Time: Displays the timestamp (MM/DD/YYYY HH:MM:SS) of when the session event completed. This column will be empty for Clipboard and Command Sequence events. Type: Displays the type of the session event. Preview: Displays the session event that was entered or executed during the session, up to the first 1024 characters. Use the Details option in the Action menu to see all the characters. Details: Displays the full list of characters entered during this session event. Jump to Recording: Opens the in-browser video player and jumps to the session time when this event started. This option is only available when the session was recorded.